Let’s start with what the programs have in common. After joining and setting up your own free account, both Zotero and Mendeley let you create public groups to share with other people a library of citations for interesting books, articles, papers, and webpages. Starting a new group works pretty much the same in both platforms — you go to the Groups tab and click on “Create a new group.” Typically a group is focused on a particular topic, so you should give it a name that reflects the topic. The person who starts the group, or anyone that person designates as a group administrator, sets the restrictions for the group, like who can add items to its shared library. (Adding items to a group library works similarly to adding items to your personal library in each program. Check out my previous post for more on this.) Anyone can view the libraries of these public groups, but the group administrators determine who can join. 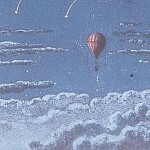 A public group can have either open membership, meaning anyone can join, or closed membership, requiring an invitation or application to join. Once again, this is something the administrators decide when setting up the group. Here’s how the group set-up page looks in Zotero, with the different membership types listed (click on any of these images for a larger view): Both Zotero and Mendeley allow you to create as many open public groups as you want. You can save citations, webpages, video links, etc. into the public group’s library to share with members and anyone who views the library. But you won’t be able to share actual documents or files, like PDFs of articles, with a public group – that is not permitted due to copyright and licensing restrictions. So it might be better to think of a public group’s library as a reading list, rather than a place to share documents. But it’s a great way to create and share a list of useful resources on a specific topic with other interested people. In addition to starting your own public groups, you can search for public groups created by others that you might want to join. That lets you find out what colleagues or even perfect strangers are reading on a subject you’re also researching. You will find a Search Groups option under the Groups tab in both programs. At this point, there are more public groups set up in Mendeley than in Zotero. For example, a search for groups using the keyword “biology” found 302 groups in Mendeley but only 23 in Zotero. The public groups in Mendeley also appear to be more active than those in Zotero, with more members sharing more stuff, especially in scientific circles where Mendeley has really taken off. So you’re probably thinking, “These public groups are good, but what if I want to share things with only certain people? Or what if I want to be able to share documents and files, not just citations?” Then you can create a private group, which will not be visible to anyone outside the group and which will be able to share files. For a private group, members must be invited by a group administrator before they can join or view what the group is sharing in its library. These private groups really are private – no one can find them just by searching, so no one will know they exist but the members. Your own super-secret club! This is where we start to find major differences between Zotero and Mendeley. 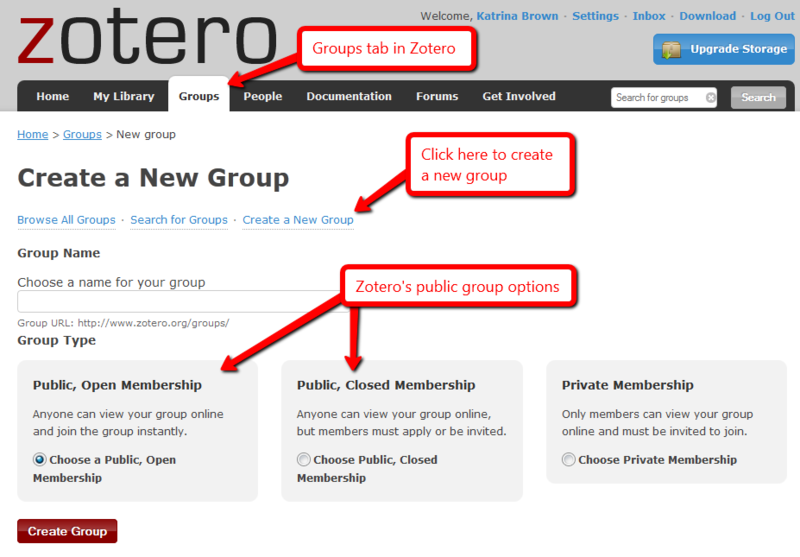 Zotero lets you create as many private groups with as many members as you want, even with a free account. But after recent changes to its account structure, a free account on Mendeley only allows you to create one private group with up to 3 members. To create more than one private groups or to add more than 3 members, you would need to purchase a team plan, which starts at $49/month. Members of a private group in Zotero are able to share full documents, like PDFs of articles, and each private group has its own discussion list, where members can post comments or questions for each other. These options are useful if your group is working together on a research project and you don’t want to rely on email for communicating or sending documents back and forth, or if you want one place to store all of your work. 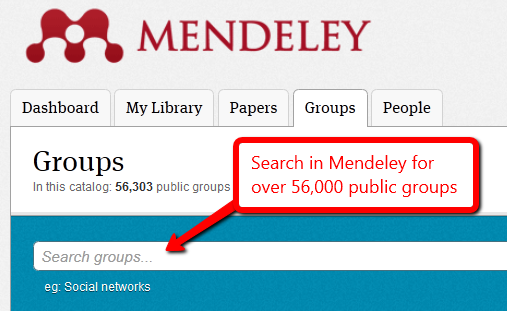 By comparison, Mendeley offers more robust tools for use within a private group. For example, each group (public or private) is able to communicate Facebook-style with its own Group Activity feed. You can even add comments or “like” something posted by another member. Like Zotero, private group members can share full documents. And using Mendeley Desktop (the standalone version of the program that lives on your computer), private group members can add highlighting and notes to their shared documents. One particularly neat feature – each member’s changes show up in a different color on the document, so you know who added what. Zotero does not offer this feature, though you can add highlighting and notes to a PDF using tools in Adobe Reader or Acrobat, then save it with the changes to your group’s library in Zotero. 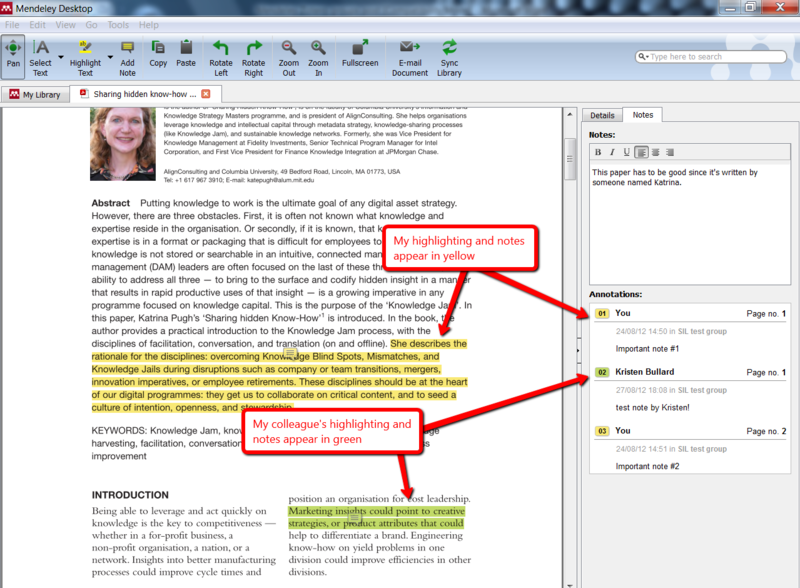 But this doesn’t give you the handy-dandy multi-user/multi-color annotations like in Mendeley. Zotero does have a Note field within a shared document’s record where group members can add notes about the document. So to wrap up — for collaboration within a private group, neither Zotero nor Mendeley is perfect. If you want to create a group of more than 3 people who can share documents with each other, Zotero’s free account is the better option. This is a definite advantage since you would need to pay for a serious upgrade in Mendeley to create a larger private group, or more than one private group. But if you have a small group of 3 or fewer — say, for a class project — then Mendeley’s collaborating tools are really useful. For a public group, Mendeley reaches more people since it has a bigger community of actively participating users, and I like its Group Activity feed for communicating. In addition, Mendeley really takes advantage of people sharing stuff “in the cloud” by having a huge online library of papers and citations contributed by its members that anyone, even non-members, can access for research. Final overall breakdown — When it comes to collecting information in your own online library and creating citations in your own papers, both Zotero and Mendeley are good, easy-to-use tools. For collaborating on research projects with a group, Mendeley’s options are better but Zotero lets you share with more people/groups using your free account. So as always, think about what’s most important for your own work when deciding on the right tool. 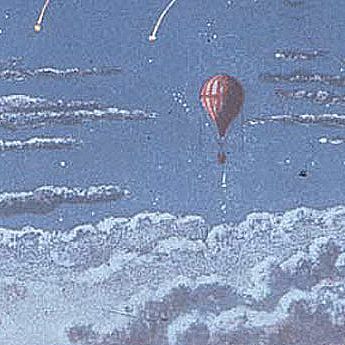 This has been the latest post in our series Library Hacks, where we take a look at cool and interesting online resources from the Smithsonian Libraries and the cyberworld at large. For collaborating on research projects with a group, Mendeley’s options are better but Zotero lets you share with more people/groups using your free account. So as always, think about what’s most important for your own work when deciding on the right tool.